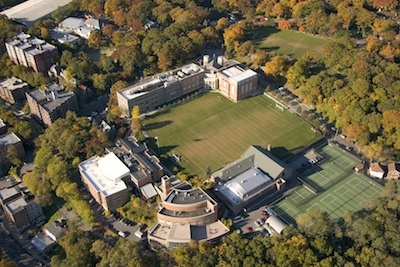 Horace Mann School’s physical plant includes buildings and grounds on four campuses: the Upper/Middle and Lower Division campuses located within a block of each other in the Bronx, the Nursery Division campus in Manhattan, and the John Dorr Nature Laboratory in Washington, Connecticut. The physical plant also includes a house for the Head of School and several other structures that house faculty members, administrators, and the Alumni and Development, Business, and Community Service and Service-Learning Offices. During the last twelve years, Horace Mann has completed more than $100 million in renovations and new building. The mission of the Department of Facilities Management and Security is the maintenance and enhancement of this expanded physical plant, which is used seven days a week, twelve months a year. The educational program of the School is well-served by the physical plant. Classrooms on all campuses are generally large, well lit, and comfortable for students and faculty. New performance spaces and studios support the varied needs of student artists, musicians, dancers and actors. Large central spaces, like the Rose Hall atrium, provide gathering locations for students and grade-wide meetings and have proved useful in unplanned ways, such as providing locations for large-scale physics experiments. The spacious and airy library and cafeteria on the Upper/Middle Division campus allow students to study, eat and congregate comfortably. Teachers in all divisions have specified locations where they can carry on the varied activities that support their classroom work. All campuses have play spaces for students that include fields, tennis courts, gymnasiums, a fitness center and a swimming pool. The John Dorr Nature Laboratory has the space and facilities to offer a residential program that emphasizes leadership, teamwork and outdoor skills. The Director of Facilities Management and Security works with the Heads of each division and with the Head of School to insure that the school is in compliance with applicable regulations and statutes. Horace Mann School has a computer network comprised of over 1800 desktop and laptop computers. All buildings on our Bronx campuses are connected via a fiber optic backbone with ample redundancy and spare fiber capacity. The Nursery Division and John Dorr labs are connected via full-time VPN via local providers. Our Bronx campus internet connection is comprised of a 500/500 Mbps Ethernet circuit from Optimum Lightpath and a 100/100 Mbps fully redundant circuit from Cogent. These provide excellent speed and reliability to the entire organization. Our network also includes dozens of virtual and physical file servers, storing files and hosting databases to support all administrative and academic school operations. These databases are integrated and receive their data from Senior Systems, our student information software. HM's Technology Department also manages and supports the telephone systems, email systems, multiple external websites, a debit card POS system for the cafeteria and bookstore, emergency voice broadcasting services, the Naviance College Counseling service, and customized internal databases. The Technology Department also manages electronic communications, including the Across the Divisions e-newsletter, community e-mail blasts and school-wide calendaring of events. All classrooms are equipped with full Audio-Visual systems. All performance spaces and many other public spaces are also equipped with highly adaptable AV systems. The Technology Department is responsible for specifying, installing, training and maintaining all AV systems campus-wide. Every classroom has at least one permanently installed, up-to-date computer with full-time internet access, many with SMART Board interactive whiteboards. There are also several computer labs across campus for student and faculty use during class and free time.